Have you been thinking about cloud computing for your business, government, or educational institution? Have you been thinking about cloud computing for your business, government, or educational institution? When choosing where your data is kept, you will have a lot to consider. Here are some of the advantages of choosing cloud computing! With cloud computing, you will always be able to use the latest software available as soon as it’s released. This will allow those in your organization to be more productive because the software will be faster and easier to use. Most software only releases updates a couple of times per year, and even then it can take a significant amount of time to get updates installed. Most cloud computing software updates automatically. When you run a physical data center, you have to purchase all of the necessary hardware and cords and then pay someone to assemble it into a network that works for you. You then have to keep it somewhere in your building and make sure it stays at the right temperature and that it is protected from the elements and other physical threats. With cloud computing, none of that is necessary. Sure, you can keep a physical copy of your data on-hand just in case, but you don’t need huge server towers or anything for that. Cloud computing services are available at a variety of different price points. It is easy to find a service that fits your organization’s budget. Once you find a provider that works for you, it is easy to purchase more storage during peak business times and downgrade when you don’t need the storage anymore. With traditional data storage methods, you have to purchase the amount of storage you will need for peak times and just let it sit empty when it’s not needed. Since cloud computing is all done online, it allows for people to easily work from wherever they need to. 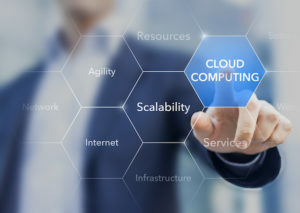 With all necessary company data in the cloud, employees can access it from home, job sites, or anywhere else they have an Internet connection. This allows people to complete work tasks efficiently. To find out more about our hardware services, printing and imaging services, or to hear more about how a dynamic team can help meet your information technology needs, send us an email or give us a call at (301)-846-9901 today! To keep up with all of the latest news, read our blog and follow our official pages on LinkedIn and Twitter! This entry was posted on Thursday, March 29th, 2018 at 5:01 pm. Both comments and pings are currently closed.